Where to Buy in Kamloops? Upper South side of highway 1 on the West end. 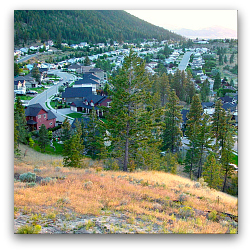 Parts of Aberdeen are at Kamloops' highest elevation, providing a few more weeks of cooler winter temperatures. Can be a few degrees cooler in the summer than the valley bottom. Aberdeen Elementary 2191 Van Horne Dr.
Mostly larger residential lots with a mix of various size acreages and farms within the Agriculture Land Reserve. Located mostly on a hill (Lower than Aberdeen and Juniper) above the south end of Westsyde Rd. Batchelor Hills Dr leads to Lac Du Bois Grasslands Protected Area. There is an educational site on McQueen Lake where many elementary schools go for day programs and even over night excursions. Below Batchelor Hill in the northwest section of the valley bottom along the Thompson River. Flat lots are enjoyed by resident gardeners. Singh St. Soccer Bowl – located at Singh St and Holt St. Most easterly area within the city limits. Mostly level lots with some waterfront properties bordering the north side of the South Thompson River. A quiet area surrounded by greenspace whick is favoured by bikers, hikers and their dogs for its trails and views. Sections of homes 20+ years or older, as well as newer homes and townhomes. Juniper Ridge Bike Ranch – Top of Highland Dr. 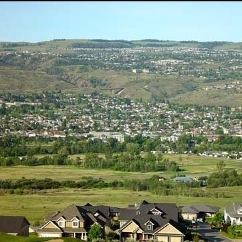 Backs onto Kenna Cartwright Park which is popular amongst hikers and bikers. 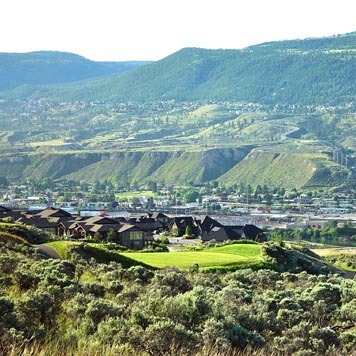 A Hiker's Paradise, this park offers an extensive network of gentle nature trails for hiking or cycling with panoramic views of the city, the Thompson Valley, Kamloops Lake and the convergence of the North and South Thompson Rivers. Is in the valley bottom north of the Thompson River and west of the North Thompson River. Well established area with a mix of multi-family and single family houses. McArthur Island Park is a sports enthusiast and nature lovers jewel. Golf, soccer, football, baseball, and cricket games can be viewed as you stroll around the perimeter of the park on the paved trail. Bert Edwards - Big Little Science and Technology Center 711 Windsor Ave.
NorKam Secondary - 730 - 12th St.
Small community on Pinantan Lake, approximately 30 minutes from Kamloops. There is a general store and post office outlet. Many lakefront properties, as well as single family homes and farms/acreages. North of the city between the Yellowhead Hwy (Hwy 5) and the North Thompson River. Located east and just outside the city limits on the north side of the South Thompson River. Outside of the golf community you will find many small acreages with some river front properties basking in the southern exposure. Split into Upper Sahali (above/south of the #1 Hwy) and Lower Sahali (below the #1 Hwy) just above the downtown core and West End. A well established area popular amongst those who want quick access to services as it is 5 minutes to city center. South Sahali Elementary – 1585 Summit Dr. This is one of two French Immersion elementatry schools in Kamloops. 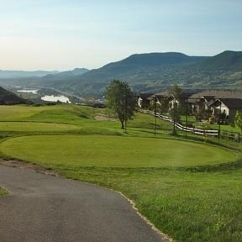 McGowan Park Elementary – 2080 Tremerton Dr.
Kamloops is known as Canada's Tournament Capital and this park offers an ideal place to watch a good ball game. This award winning park includes ball diamonds, playground, pond and a community centre. 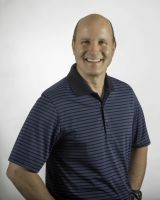 There is also a Water Spray Park, washrooms - change rooms and a fresh water fountain is available. This is a great family hiking and picnicking area located just off Columbia Street, near 6th Avenue. (Watch for signs to the park) There are plenty of grassy areas, picnic tables, barbecues and great hiking trails leading to the caves and the falls. Marion Schilling Elementary - 2200 Park Dr. Established neighbourhoods with heritage homes and numerous multi-family developments including high-rises, apartments and town homes. Exhibition Park - Located at the foot of 10th Avenue and River Street. This stadium is the perfect venue to host or watch softball tournaments. Complete with dugouts, announcer's booth, bleachers, concession, and lights for night games as well as tennis. Memorial Arena - 740 Victoria St.
Stuart Wood Elementary - 245 St. Paul St.
St. Anns Academy – 205 Columbia St.
South Kamloops Secondary - 820 Munro St. This is the French Immersion high school. 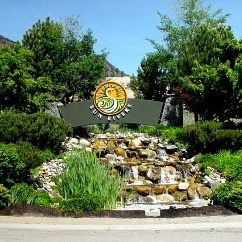 Sun Rivers golf course is intertwined amongst the newer homes. Mostly stratas on easily managed lots. Before Westsyde, below Batchelor Heights. Includes many single family homes in established neighborhoods. Several townhouse developments, and a small mobile home park. Westmount Elementary - 745 Walkem Rd. North end of town. Like its name, Westsyde stretches along the west side of the North Thompson River between the hill and the river. 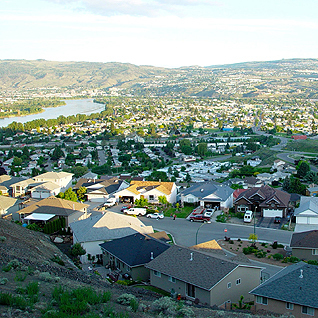 A number of waterfront homes rest on mostly level lots. A mix of older homes on established landscaped lots and newer developments with pockets of luxury homes, especially at the far north end of Westsyde by The Dunes golf course. Westsyde boasts a great community feel with lots of community associations and events. One challenge with living in Westsyde is the one road in with a number of traffic lights and traffic, especially as Westsyde grows. Westsyde Park - Bring carrots! A favorite spot for those who enjoy feeding the small animals at a privatly owned hobby farm that borders the park. Vending machine will dispense grain for a small donation. David Thompson Elementary - 1051 Pine Springs Rd. Information on this site is from sources deemed reliable but it should not be relied upon without independent verification.